The ACS AN-X Series dust collector valve for airlock applications is ready to eat your dust and replace your uncompliant FT or AN valves. 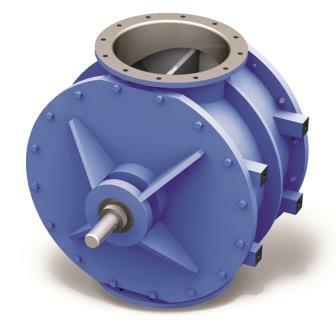 This NFPA 68 and 69 compliant rotary valve provides continuous transfer of any discharge particles from the hopper to your collection system. The AN-X 8-vane rotor consists of NFPA-compliant steel rotor tips to replace uncompliant rubber tips in FT and AN valves. Unlike rubber tips that won’t withstand the heat of an explosion, steel tips can contain any flames and prevent deflagration from spreading through your machinery. The AN-X also replaces uncompliant inboard bearings featured in FT and AN valves with NFPA-compliant outboard bearings. The outboard bearings isolate bearings from blow-by and damaging materials or contaminants, ultimately extending lifecycle maintenance and eliminating an ignition source for combustible dusts inside the valve. Drop-in replacements can be done on your schedule, without disrupting production. Because the AN-X valve is shorter than a typical AN valve, no extra parts are necessary. The AN-X series rotary airlock valve has housings that are CNC-machined to precise tolerances and cast in North America. The valve’s design also protects the bearings in high-temperature applications up to 500°F, while managing pressure differentials up to 15 psig. The valve is built for heavy-duty construction and sanitization for OSHA compliance, and comes in mild steel or stainless steel. ACS AN-X series dust collector valves are available in three sizes from 8 to 12 in. Shaft seal types include an ACST-4 glandless Teflon shaft seal.